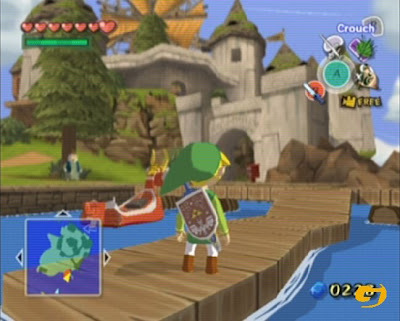 A couple of months ago I wrote an entry about my early experiences with The Legend of Zelda: Ocarina of Time, and I've since felt just a little bit guilty that I've now blogged about that game but neglected my favorite of the Zelda games, which is, unquestionably, The Wind Waker. By complete coincidence, I also happened to overhear a Twitter exchange Friday night between Steve Amodio of 8-bit Hacks and Michael Abbott of The Brainy Gamer. They were both discussing Wind Waker, and I couldn't help but get in on the conversation. I could only stand a couple of tweets before I lost all hope of resistance; I ran over to the shelf, pulled out that little Gamecube disc, and pushed it into the Wii. I was transported. Wind Waker is a game that it's hard for me to think about objectively, much like Ocarina of Time. I just have too many memories, fond ones, that I have to dig back through to get at the experience of playing it. So indulge me for just a moment while I recall some of those. I graduated from college in the spring of 2003, and if you're a gamer with a memory, you might recall that that was just about the time of Wind Waker's release. That April, I'd gotten myself a little early graduation present, a Nintendo Gamecube, with a copy of Metroid Prime. I'd tried to hold out on buying another console, because I already owned a Playstation 2 that I'd halfway convinced myself I was buying for the DVD playback capability, but I'm only human, and try as I might, I just couldn't keep my eyes off the reviews for Metroid. It had been two generations since there'd been a new Samus Aran adventure, and I needed my fix so, so badly. Plus, there was a new Zelda that had just come out. That would have to be mine soon, too. Well, I spent a little of April, but not too much, playing Metroid Prime, as did my roommate Andrew, who to this day needs to come to New York and finish his damn game. Really, I did a good job of controlling myself, considering this was Metroid. But that was it; the money was just about gone, and if I was going to survive until I could make it back home and get the old summer job back, I needed to cut back spending. No more games. But I guess I'd just lucked out and happened on the world's most generous and perceptive roommate, because without needing to, without being expected to at all, Andrew bought me Wind Waker as a graduation present. I'd never deserved such an incredible gift less than this one, and I was sincerely touched. I'd say I'll repay the favor one day, but I honestly don't think it's possible. I don't really care to recall much else about my very earliest moments with the game, since some of them were sullied by the presence of a strange green liquid we found in our apartment, but I will talk about the elements of the game that make it my favorite. First of all, if you own the game and haven't gotten a chance to do this, take the King out somewhere quiet and wait for dark. Look up at the night sky. I have never seen a night sky like that in a game, not ever. I have never been so immersed in a game as when I take a moment to rest and look up at that sky. The fact that you can then tilt your view down and maybe catch a glimpse of a distant island, maybe even the Tower of the Gods, gray and misty through the spray but still visible from miles off ... that just holds the illusion in place. The game is perfectly paced, or more accurately, it isn't always strictly paced at all, though there's always something rewarding to do. Nintendo tailored the usual Zelda schtick to what I suppose was the prevailing mechanic at the time, the open world of the sandbox game. The complexity and number of dungeons was scaled back; this time around, there were only a few short dungeons prior to the final one, depending on how you count these--and I'm perfectly willing to admit that things may only have felt shorter because there was no water temple this time around. A greater portion than usual of the central quest took place in the overworld, and the onus was on the player to sail around the huge ocean finding charts (and then--how I do love this game--following them! ), performing a few tasks for the game's various NPCs, and in one particularly rewarding quest, locating three strange statues and placing magical pearls in them. A lot of players have complained about this structure, saying that the incessant sailing (and there is a lot of it) is a bit of a chore. I can certainly sympathize, because after the fifth or sixth time, I didn't enjoy having to pull out the Wind Waker and change the wind's direction. Still, for me, the immensity of the ocean and the need to sail across it continuously made the game's world feel real. I think "real" is a word that's applied to games far more often than it really applies; looking back, I can really only think of a few games that had worlds I thought felt actually real. One was Super Mario Bros. 3; prior to that, I'd never realized there could possibly be any logical reason for the transition from level to level in a game, but SMB3 had levels tied together within thematic worlds that, at least at the time, made perfect sense. Super Metroid presented a world that felt entirely organic; I completely understood how taking an elevator down from the right place in Brinstar could lead you to Norfair, and for heaven's sake, the world finally had a surface you could explore, to say nothing of the dark, lonely reintroduction to Zebes. There aren't a lot of games that can do this quite right, and though Ocarina of Time had had a few odd moments that drew me in completely, the world never felt quite real to me; it might have been that 3D simply wasn't yet ready for prime time. Obviously everyone is going to have a different experience, but for me, the sailing mechanic was fun, and it made me feel like I was really in the game. Beyond that, the game had the most expressive style of all the Zelda games, and though I haven't finished them all, I've put significant time into every single one, even the Capcom-developed Game Boy Color titles! By "every single one," I mean every single one excepting the plainly horrendous CDi titles. 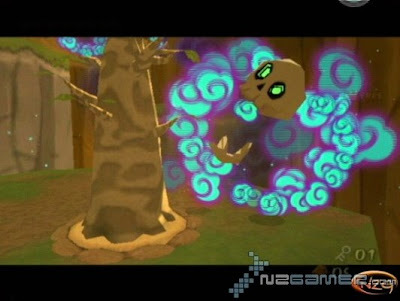 Anyway, I understand that this is a point of controversy, since Wind Waker uses cel-shaded, cartoony characters and animates several of its effects with, gasp, sprites (see the beautiful puffs of smoke in the shot above this paragraph for one example), but the graphical style fit the mood of the game completely. The wonderful music goes right along with the visuals, and there are even loud chords that play ascending tones to underscore sword hits. The whole audio-visual presentation is brilliant and simply fun, and despite the lighter aesthetics, Wind Waker has what's always seemed to me an affecting storyline. I won't spoil it, but I will say that prior to playing Wind Waker, I'd begun to assume that there was absolutely no significant tie among the various Zelda games; Wind Waker, for its part, makes it clear that a link does exist, and it's crucial. To this day, I'm not sure if this isn't just a bit of retconning on Nintendo's part, some sleight-of-hand to make it look like there's a context that these stories fit into when, in fact, there really isn't, but in the experience of playing Wind Waker, I found myself caring deeply about the characters and the world they inhabit. Again, funny little cartoon characters inhabit Wind Waker's world, and to some they seem simple, but if you really look, you'll see that they've been designed and animated with real love. The level of detail comes out when, for instance, you visit Link's grandmother and witness the tangible concern she feels for her grandchildren, or when you encounter a Moblin for the first time--every part of those guys moves as they clomp past you. Several of the most beautiful moments in the game would be spoiled if I described them to you, but suffice it to say that the environment in Wind Waker is every bit as carefully crafted and stunning as its inhabitants. And to my surprise, given that this is such a funny-looking game, I will never, ever be able to get the final encounter between Link and Ganon quite out of my head--another series favorite for me, incidentally. So, good gift? Yes, excellent gift. Pictures swiped shamelessly but with much gratitude from Gamespot and NZgamer.com, respectively. New Title for the Gaj Forum?